OK so anyone who knows me, knows that I DO NOT claim to be Martha Stewart. I don't mind cooking but honestly there are other things I would rather do. But I DO have some fabulous recipes to share with you today and the first one has nothing to do with being in the kitchen. There is great challenge up at Challenge Me Happy today. This one is a Recipe Challenge. Of all the challenges Annelie gives us, these are my favorite. So here is your challenge, if you choose to accept it. Mists/ paint and border punches are freebies! The winner this week gets a kit from a brand new NZ online store called Heartistry and I have to tell you, they have the COOLEST stuff in her store! The prize pack sounds amazing, you will have to check it out. So here is my layout for the challenge. Have you ever found a product that you just love and you HAVE to buy everything they make? 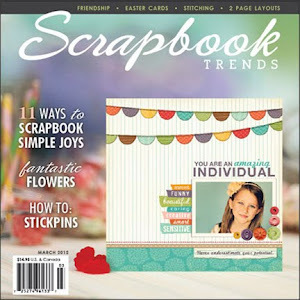 I have fallen in love with Simple Stories, OK, so maybe that happened a while ago, but I was at my LSS recently scrapbooking with K and ended up buying a ton of their papers and embellishments because I love every piece of paper they make. Their journaling cards were perfect for this challenge so that is where I started. I just adore that yellow plaid too. It is definitely my recent go-to paper. So...in staying with the theme I thought I would post a favorite recipe I found lately. It has become hard to find recipes that my whole family enjoys (the main reason I do not enjoy cooking). I found this recipe at Recipe.com recently and knew it would be a hit. In large saucepan of lightly salted boiling water, cook spaghetti 1 minute less than directed on package. Drain. Heat oven to 350 degrees F. Coat 10-inch nonstick skillet with nonstick cooking spray. If skillet handle is not ovenproof, wrap with aluminum foil. Coat with crumbs. In bowl, combine spaghetti, pasta sauce, mozzarella and pepperoni. Stir in beaten eggs. Spoon mixture into prepared skillet. Bake in 350 degree F oven 30 minutes. Sprinkle with Parmesan. Bake until cheese is golden brown, 10 minutes. Let cool 10 minutes. Cut into 6 wedges. Makes 6 servings. Have a fabulous week and thank you so much for stopping by!!! I'm loving Simple Stories too. Their collections are so versatile. I love how you used the journaling cards on your page! 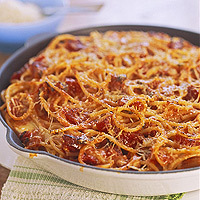 That spaghetti pie looks too good!!! So is your layout!! ITA with you on simple stories!! Both recipes look totally de-lish. I go nuts on collections as well. I love their paper too!! I was on my Sacramento trip and looked for Life Stories and they told me it flew out the door lol!! I love the picture of the girls in this sweet LO! And I will have to try the spaghetti yum!!!! Such a cute layout and thanks for a yummy recipe!! Beautiful LO, Lisa! 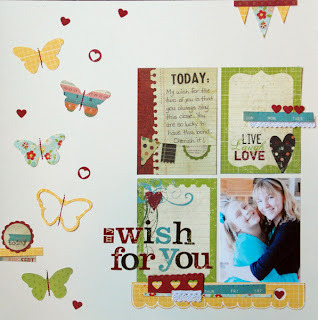 Totally adore all the colors you've used and those butterflies are such a great embellishment for your page. What a cute layout! And the sphagetti pie looks delicious! I have the same problem here, though, with not everyone liking the same thing; hence, cooking is sometimes a chore! The recipe looks great (I'll show it to dh for him to make, lol).